We wonder how these chess parks come up in the first place. Must be because someone loves chess so much that they start with a single table and then the chess just grows. Similar must be the case with this international chess park in Venice. 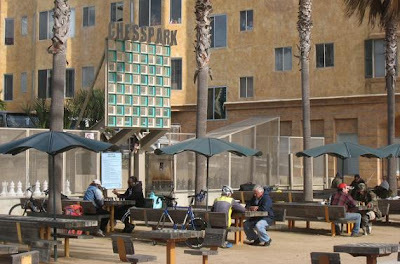 At the International Chess Park on Venice beach, the players are young and old, from seasoned pros to beginning novices. A Harvard-trained mathematician may be taking on a homeless man; a curious teenager might be squaring off against a wily street performer. Several different languages rise up from the soft murmuring at the tables, all set against gainst the backdrop of the Pacific Ocean with its soft yellow beaches. Many come to learn, teach, and listen to the myriad stories the eclectic participants weave as they move their pieces around sandy, well-worn game tables.